Music in Georgia ranges from folk music to rhythm and blues, rock and roll, country music and hip hop. Nationally known attractions, amusement parks, animal kingdoms and state parks mean there's something for everyone in Georgia. Bright lights, beautiful sights, and fantastic nights are the just start of entertainment in Georgia. Whether it is day or night, there is no shortage of places to go and things to do in Georgia. 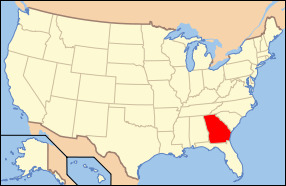 Georgia has Florida bordering its south side, the Atlantic Ocean to its east along with South Carolina, and is bordered on the north by Tennessee and North Carolina. The northern region of Georgia is located in the Blue Ridge Mountains which is a part of the Appalachian Mountains. Georgia is also the most extensive state on the east side of the Mississippi River, and its highest point of elevations sits at 4,784 feet above sea level. The population of the state has been recorded at roughly 9.8 million spread over its almost 60,000 square miles of land area. It has several major rivers running through it including the Chattahoochee River, Suwannee River, and Savannah River. It is also home to several well known lakes such as Lake Lanier, West Point Lake, Lake Hartwell, and Clarks Hill Lake. The major industries in the state are considered to be timber (pine ), agriculture, and textiles. 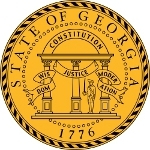 The state song is “Georgia on My Mind” and the state motto remains “Wisdom, Justice, and Moderation”. The state bird is the Brown Thrasher while the game bird is the Bobwhite. Other state icons include the state marine mammal which is the Right Whale, the state Possum which is the Pogo Possum, and the state insect which is the Honey Bee. The state fish is the Largemouth Bass, and the current world record largemouth bass is also recorded as being caught in Georgia. The state shell is the Knobbed Whelk, the state flower is the Cherokee Rose, and the state tree is the Live Oak. Georgia is a big player in the U.S. Economy and is also a great state in terms of tourism. Many people travel to Atlanta for entertainment and to Georgia in general to enjoy the climate in the region. Overall Georgia is widely regarded as one of the big contributors to the U.S. Economy.